Under today’s paradigm for distributed generation, customers typically size the capacity of their PV systems to meet most or all of their annual energy demand, which results in a PV system that often produces more power than their home or business needs during the middle of the day. When this occurs, the PV system exports power onto the utility grid and essentially uses the grid to store excess energy during the daytime. Later in the day, as the PV system’s output declines and eventually produces no power when the sun sets, the customer draws power back from the grid to meet their evening and nighttime electricity needs. At low levels of DER (Distributed Energy Resources), this mode of operation results in a small reduction in load on the overall utility system, and the aggregate impact on the grid is minimal. With significant higher levels solar PV expected in the next two years, integrating additional customer-sited PV that operates in this mode becomes more challenging. At a basic level, the overall electricity system currently has a finite capacity to integrate variable renewable energy sources that may be defined by the total gross load on the system and the minimum amount of conventional generation need to maintain a stable grid through potential contingency events, and provide reserves to accommodate load and generation forecast errors. 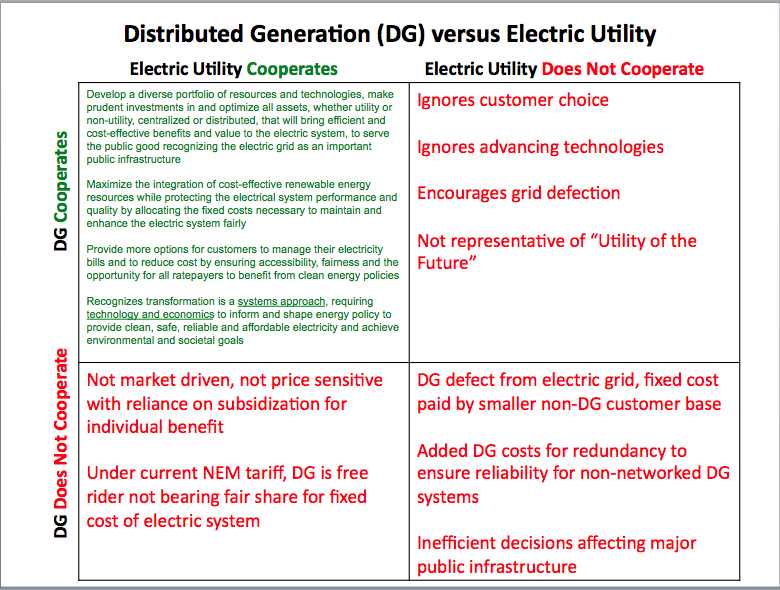 The ongoing electric utility versus solar debate further puts forth a false argument and a premise that one must choose sides. Renewable energy advocates have been very successful in promoting and gathering support for and addressing mainly one side of the electric system equation, the supply side. Buzzwords like ‘100 percent renewable’ and aspirational concepts like ‘energy democracy’ may prompt near-term achievements for individuals but often lack detail to achieve an advanced electric system that is accessible and affordable for all electricity users. Even with Hawaii’s high penetration of rooftop solar installations, over 80 percent of electric customers still lack access or funding, or have no desire to install a distributed generation system and must rely on the electric utility while shouldering more of the fixed-cost burden of the electric system under the current net energy metering program. 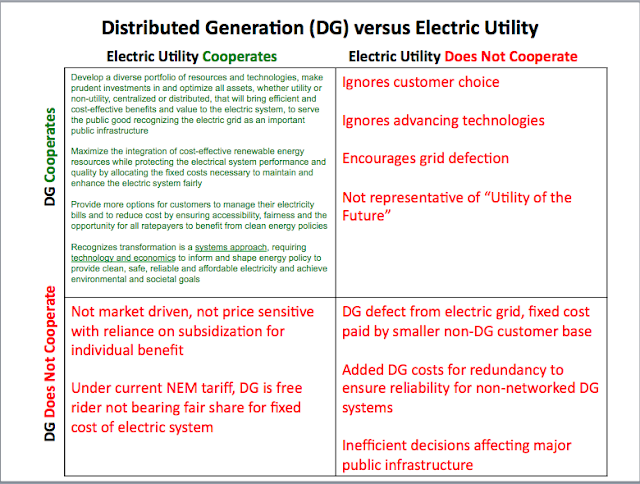 While a few, like economists and others who study game theory, may understand the strategic and methodical decision-making process that Hawaii must employ to achieve optimal results in the design of an advanced electric system, the rationale and enormity of this transformation and paradigm shift has not been adequately explained to the electricity customer, who must, inevitably, pay for all costs. Hawaii faces a real-life prisoner's dilemma as the continuation of the present situation may produce some short term gains for a few but it will eventually become an unsustainable dichotomy for all. Therefore, cooperation and a managed transition, informed by technology and economics, is critical in recognizing that the finite capacity of the electric system should be viewed as part of the commons, a vital infrastructure and resource that must be shared and carefully managed to promote the public good. 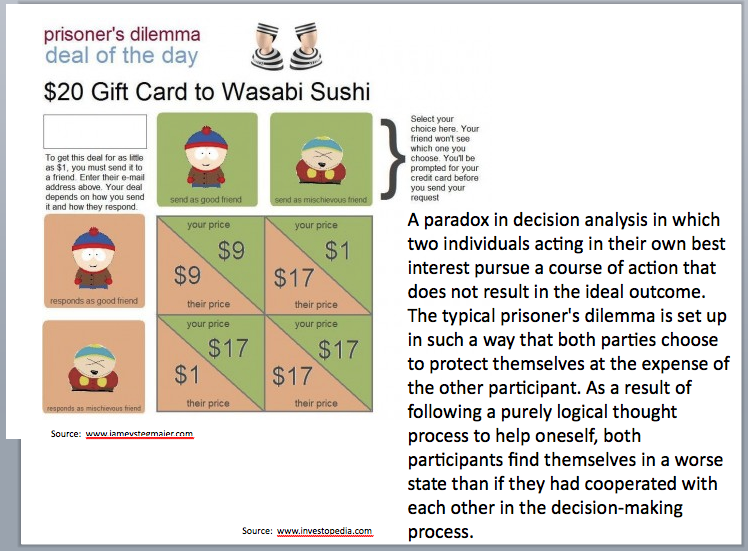 Inserted below are South Park friends demonstrating the concept of prisoner's dilemma followed by a matrix I developed to outline the possible outcomes of cooperation and no cooperation between the electric utility and DG.